PARIS -- Fiat S.p.A. CEO Sergio Marchionne seized an opportunity in the U.S. after Renault SA CEO Carlos Ghosn concluded there was too much risk. 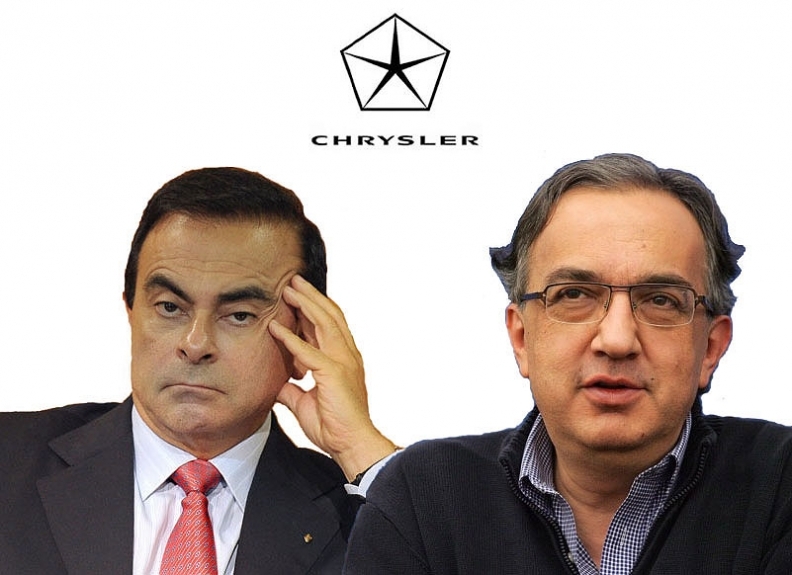 Ghosn turned down the chance to buy Chrysler in 2008 at the height of the recession, opening the door for Marchionne to swoop in and receive 20 percent of the American carmaker without paying any cash in exchange for technology and management. "We pulled out because we were seeing a very dramatic crisis happening," Ghosn said in an interview last month. "I still think we made the reasonable decision." Marchionne since then has done everything to prove his rival wrong, pursuing a rapid integration of Fiat and Chrysler that includes using the basic architecture for vehicles across brands, combining top management and sharing factories. Earlier this month, Fiat raised its Chrysler stake to 53.5 percent, reaching a majority two years earlier than originally planned. Even before a botched industrial espionage probe in France that bruised his reputation, Ghosn had ruled out a deeper integration of the 12-year-old alliance with Nissan Motor Co. for the time being. Renault owns a 43.4 percent stake in Nissan, which in turn holds 15 percent of Renault. Prior to dropping the Chrysler talks, Ghosn had said adding a U.S. partner would make sense. Tie-up talks with General Motors Co. failed in 2006. "Ghosn seems to have stopped halfway, and Marchionne is at least saying he wants to go the full nine yards," said Erich Hauser, a Credit Suisse analyst in London. "Marchionne's trying something different, and so far it looks like he might be right." Since Fiat took management control of Chrysler in June 2009, the Italian carmaker's shares have jumped 91 percent, almost double Renault's 52 percent gain. Fiat, minus the industrial operations the company spun off on Jan. 1, posted an operating margin last year of 3.1 percent, while Renault's return on sales was 2.8 percent. Chrysler aims to almost triple what the carmaker calls modified operating profit to more than $2 billion in 2011 from $763 million last year, and to earn as much as $500 million in net income. Modified operating profit excludes interest, taxes and items such as pension-related costs. Marchionne has sought to push past Ghosn as a consolidator after concluding that alliances don't squeeze enough value out of the partnership. Ghosn disputes that thesis, citing joint purchasing and other cost reductions achieved at Renault-Nissan. This past week Marchionne announced a merged management structure for Fiat and Chrysler after reporting Fiat's second-quarter earnings with Chrysler consolidated into the results for the first time. The CEO has laid out a plan to use common technology for Fiat, Chrysler, Jeep, Dodge and Alfa Romeo models. He'll probably receive an additional 5 percent of Chrysler without paying any cash later this year when Chrysler builds a fuel-efficient car using Fiat underpinnings. Marchionne will end up paying about $2 billion to reach a 58.5 percent holding. Ghosn this year has been mired in a botched spying investigation in France after falsely accusing company managers of espionage. The fallout led to the resignation of his second- in-command, Patrick Pelata, and concessions to the French government, Renault's largest shareholder, that included spending more time at Renault and less at Nissan. "In his early days at Fiat, Marchionne used to call Ghosn the Sun King," said Giuseppe Berta, a professor at Milan's Bocconi University who knows the Fiat CEO personally. "He said you needed sunglasses to stand close to him. Now things have changed." Ghosn told investors in February when announcing targets for Renault that a merger was "not feasible" as part of the mid-term strategy because of opposition at both carmakers. While Nissan's revenue has risen by almost 50 percent in the decade since Renault pulled the company from the brink of bankruptcy following a 1999 stake purchase, its rescuer's sales have shrunk 3 percent. Nissan is now the larger of the two. "Renault is the main shareholder in a company that's fast outgrowing it, which means there is frustration on all sides," Paris-based Deutsche Bank analyst Gaetan Toulemonde said. "Nissan staged a spectacular recovery, while Renault is still on the starting block, with the same problems today as 10 years ago." Marchionne cites the imbalance within Ghosn's alliance as a reason for his determination to push for a full integration. "You can't have a subsidiary that makes more money than the parent," Marchionne said in an April interview. "It goes beyond questions of governance. It doesn't work." The Renault boss maintains that car-industry takeovers are often doomed to fail, citing examples such as Daimler AG's merger with Chrysler, which was unwound in 2007, or a Renault-Volvo tie-up plan abandoned in 1993. Marchionne also must still prove that his plans for a merged Fiat-Chrysler will really work once it's fully implemented. "The Renault-Nissan alliance began in 1999, an era of rapid consolidation among automakers," said Rachel Konrad, an alliance spokeswoman. "Twelve years later, the alliance is the only major partnership still intact and still creating value every year -- 1.5 billion euros in synergies in 2010 alone." Ghosn and his top managers, who were offered a deal from the U.S. government similar to what Fiat received, ended the talks two years ago because absorbing Chrysler might have left Renault-Nissan too vulnerable to the unfolding economic downturn, the CEO said. "We didn't know how bad the storm was going to be," Ghosn said in a June 28 interview. Other reasons that contributed to the decision were a weak product-development pipeline and management exodus at Chrysler, as well as the overlap between the U.S. sales networks of Chrysler and Nissan, one person familiar with Ghosn's thinking said. Because Fiat was not present in the U.S. market at the time, Marchionne also had more to gain from the acquisition. "The integration is a compelling mission for both Fiat and Chrysler, with no alternatives, which wasn't the case for Nissan and Renault," said Carlo De Benedetti, honorary chairman of holding company Compagnie Industrali Riunite SpA and a former Fiat CEO. "It is much easier to work in America on integration of two companies than in Japan."